Soccer City Stadium, formerly known as the FNB Stadium, is a stadium located in the Soweto area of Johannesburg, South Africa. It is located next to the South African Football Association headquarters (SAFA House) where both the FIFA offices and the Local Organising Committee for the FIFA World Cup 2010 South Africa. 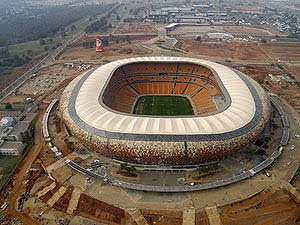 A football-specific stadium, Soccer City Stadium is currently the largest stadium in Africa with a capacity of 94,700. Most of the largest football events in South Africa are played at Soccer City and the venue is better suited to these events than the Ellis Park Stadium, where the final for the Rugby World Cup in 1995 was held. Soweto and the National Exhibition Centre in Nasrec are nearby. The Soccer City Stadium in Johannesburg has undergone a major upgrade for the 2010 tournament, with a new design inspired by traditional African pottery. The Populous sports facilities group came up with the design. The upper tier has been extended around the stadium to increase the capacity to 94,700 with an extra 99 Executive suites, an encircling roof has been constructed, new changing room facilities have been developed and new floodlights have been installed. The number of suites in this stadium has been increased to 195. The R1.5 billion tender to upgrade the stadium was won by Grinaker-LTA. The construction was completed on Wednesday, 21 October 2009. The completion was marked by a huge celebration at the stadium. The outside of the stadium is designed to have the appearance of a calabash, an African pot, the cladding on the outside is a mosaic of fire and earthen colours with a ring of lights running around the bottom of the structure, simulating fire underneath the pot. No spectator will be more than 100 metres (330ft) from the action and there are no restricted views in the stadium.